While official information for Episode IX isn’t due until Star Wars Celebration in Chicago, a number of details have leaked. Making Star Wars has previously reported the plot would be driven by the Resistance chasing a MacGuffin, but weren’t sure what the MacGuffin was. However, yesterday they reported something very interesting: the Resistance will be looking for Threepio’s memories which were wiped at the end of Revenge of the Sith. Combined with several other bits of plot information, the Saga and wider Canon, I think I see how they may all tie together. She realized, then, something she had never fully understood before. She’d always wondered what had led her father to turn to the dark side, to become Darth Vader. She’d imagined it came from ambition, greed, or some other venal weakness. Never had she considered that the turn might begin in a better place, out of the desire to save someone or to avenge a great wrong. Even if it led to evil, that first impulse might be born of loyalty, a sense of justice, or even love. As this was/is to be Leia’s movie, it’s only fitting we start with her. Leia has long struggled with the knowledge of her true father’s identity as Vader. In fact, out of concern for how it would affect her son, she never told him his grandfather’s identity. However, her son’s fall means she can no longer ignore the darkness in her bloodline and this is what kicks off the story. Looking for answers to save her son, Leia seeks to understand why her father fell. Unfortunately, there’s no one left alive who witnessed his fall. During Resistance operations, it’s learned that Bail Organa’s ship, the Tantive III, still survives. Hoping the ship contains some answers, she contacts Lando who is able to find the ship. There, the Resistance finds a backup of Threepio’s memories which were wiped after Anakin’s fall and Padme’s death. Looking through the memories, they see Padme confronting Anakin, but then come across a recording of Anakin carrying his mother at the Lars homestead. Going even further back, they see young Anakin saying goodbye to Threepio. Seeking to learn who he was carrying on Tatooine, Rey and the others travel to the homestead. Meanwhile, Leia resolves to bring her son back. Once there, Rey keeps having the odd feeling there’s something familiar about the place. Then she comes across Shmi and Cliegg’s graves. She recognizes the graves as the ones from her memories – the ones Kylo told her were her parents. (It’s further possible there are two additional graves: one for her mother and one for her.) Wondering what is going on, Rey leaves the others and travels back to Ahch-To on her own. On Ahch-To Rey learns the truth: Luke Skywalker was her father as she sensed during the events of The Last Jedi. Luke and her mother used the Lars homestead as their home and traded salvage (junk) they found on their travels. At some point, the homestead was attacked and Rey’s mother was killed and she was kidnapped. Tragically, feeling her mother’s death and the loss of the connection traumatized young Rey and she inadvertently hid from the Force. This led to Luke believing Rey had also been killed which threw him into a spiral he never recovered from. The Saga comes full circle. 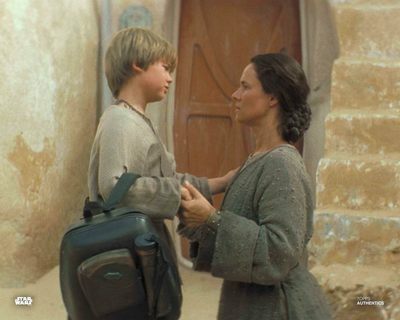 Anakin’s separation from his mother and her later death resulted in his fear of losing those he loves. His fear led to his fall and the destruction of the Skywalker family. The twins grew up without each other or their father, yet it was the bond with his own child that brought Anakin back. Leia’s ignorance of what caused Anakin’s fall drove her fear her family was predisposed to darkness which Ben may have misinterpreted as a fear of him. Rey’s loss of her mother resulted in her hiding from her connection with Luke. In the wake of the pain of loss, Luke avoided connecting with Ben when he needed it most. One family suffers generations of tragedy stemming from a Force-sensitive boy losing his mother too early. In Episode IX the Skywalkers come to understand the importance of their connections to each other. Leia learns why her father fell and tries to save her son, while Rey learns she was truly loved. This may have single handedly ruined Episode 9 for me. Because this sounds so amazing, if it doesn’t happen It would be unfortunate.